Folklorist Jeremy Harte, reviewing my book The UFO Files in Folklore Vol 122/2 (August 2011), p 226. 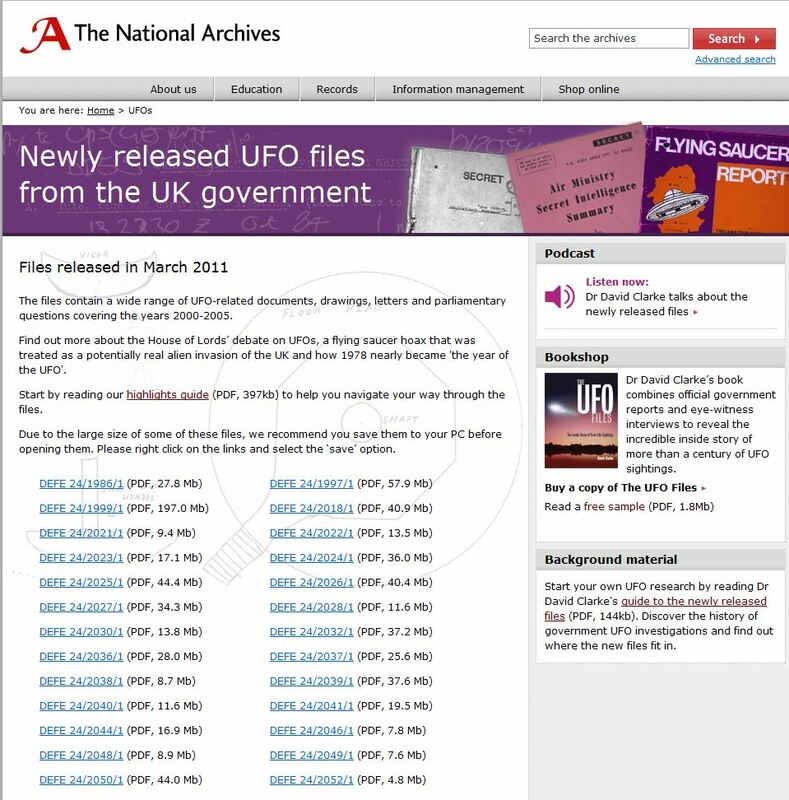 This section of my website contains highlights from the collections of UFO files released by The National Archives in the UK. From 2008 I have been acting as the external advisor to an open government initiative that saw the transfer of more than 200 UFO files from the Ministry of Defence to The National Archives at Kew in Surrey. The files contain papers detailing some 11,000 sighting reports along with correspondence, Parliamentary business, media issues and, most importantly, details of government policy on UFOs and related subjects (this category contains some papers declassified from secret). The files originate from two MoD branches, the Directorate Air Staff (DAS) – which ran the ‘UFO desk’ until 2009 – and the Defence Intelligence Staff. The DIS branch DI55 inherited responsibility for the investigation of UFO reports that had potential defence interest from Air Ministry in 1964, but in reality most reports received were simply “glanced at and filed away” by a single desk officer. Until the 1960s most files on the subject of “aerial phenomena” and “flying saucers” were destroyed by the Air Ministry at intervals of five years. But following the intervention of UFOlogist Julian Hennessy in 1967, the Minister for the RAF, Merlyn Rees MP, gave a commitment to preserve files because of public interest in their content. Unfortunately, this commitment does not appear to have been communicated beyond Whitehall which led branches of the RAF, DIS and Air Historical Branch to destroy files as recently at 1990. The surviving files held in MoD archive, dating from 1980-2009, have been made available to the public under Freedom of Information (FOI) in pdf format via a website portal here. The files are free to download for one month, after which a small charge is levied. As of August 2011 eight tranches have been released, in total containing 40,500 pages of information. Most of the files included in the release programme were created during the last 30 years, but they often contain copies of earlier papers some of which date from the 1950s (some of these were released following Freedom of Information requests made by myself and colleagues from 2000). The files are arranged thematically, with sequences that contain chronological collections of UFO reports, public correspondence, Parliamentary business and UFO policy. In addition, there is another collection of historical UFO related files that were transferred to The National Archives under the 30 year rule before the ongoing release programme was initiated. These include files on “phantom airship” sightings in WW1, reports of strange aerial phenomena reported by RAF Bomber Command during WW2 and post-war intelligence reports on ghost rockets and ‘flying saucers’. The earliest surviving sequence of UFO report files begin in 1962, reflecting the 1967 decision to preserve records given by Merlyn Rees MP. These earlier can be consulted in the reading rooms at Kew, where the original records are stored. A detailed guide to the contents of all the surviving files can be downloaded from The National Archives website (see ‘Background Briefing’). An overview of the highlights can be found in my book The UFO Files (2009), published by Bloomsbury. I doubt the release of these files will satisfy those who believe there is a deeper conspiracy to hide evidence of alien visitations, but it does reveal in forensic detail how the issue has been dealt with by the British Government during the past six decades. Inevitably, some have dismissed this exercise as yet another whitewash. For them the ‘truth’ will remain out there, no doubt salted away in more above top secret files. Nevertheless, it remains the case that full disclosure of what little the government knows about this subject is underway in the UK at least, a fact that will be welcomed by most rational observers as a landmark in open government.